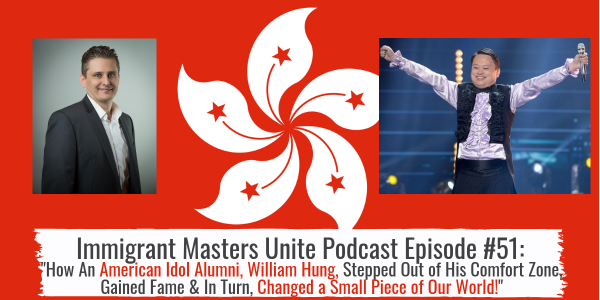 IMU 051: How An American Idol Alumni, William Hung, Stepped Out of His Comfort Zone, Gained Fame & In Turn, Changed a Small Piece of Our World! | Immigrant Masters Unite Podcast: Transform Your Business, Life and The World Around You! What would you do if you found yourself in front of Simon and Paula from American Idol? Would you open and start singing or would you freeze? How do you get in front of someone like that? How do you get exposure? What will you do when an opportunity comes and you have to step out of your comfort zone and take action? Will you take it? That’s what I tackled on today’s interview, episode 51 of Immigrant Masters Unite. Today, I have William Hung. I’m going to date myself a little bit here but William is a Hong Kong-born American Idol former singer who gained fame in early 2004 as a result of his audition performance of Ricky Martin’s hit song “She Bangs” on the third season of the television series American Idol. Today, William Hung is an inspirational speaker and business coach who shares his experience on American Idol to motivate audiences to live a more fulfilling life. Early in life, William played it safe. He was born in Hong Kong and lived there with his parents during his early childhood. They were a typical, middle class family who did things together including going to karaoke lounges to sing and have fun. That’s where his love of singing originally came from. Then, when he was 10 years old, they moved to the United States and WIlliam grew up as a responsible, dutiful son to his Asian parents. He was obedient, studied hard, and was even named valedictorian of his high school graduating class. But when he went to college, he became unhappy. Well…miserable as he puts it. He wasn’t excited about his classes or about the prospect of a future as a civil engineer. How to get out of your comfort zone. Listen as William talks about his audition, what it took for him to sing in front of Simon and Paula and how he got himself out of his comfort zone. How to not have regrets in life. You’ll hear William talk about that quite often and it’s such a great way of looking at life. How William reframed his view of the 25K contract that was initially meant to make fun of him to create a life for himself and impact people around the country.